Makaha, a little rural town of approximately 9,000 people on Oahu, is famous for its surfing beach where popular tournaments are held during the winter season. 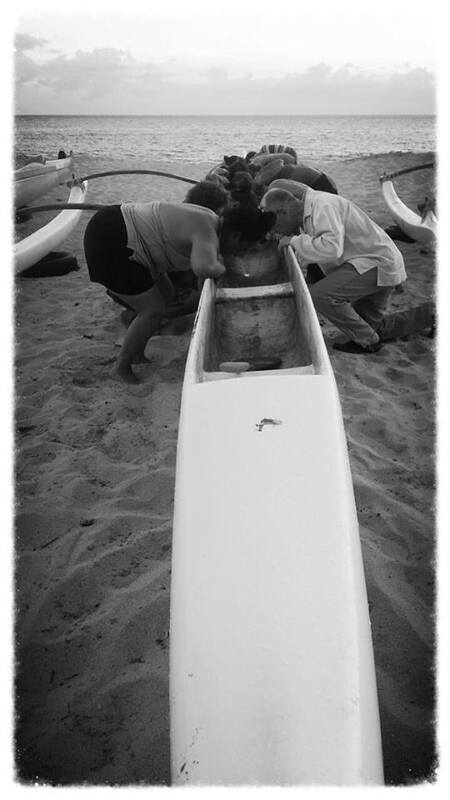 When spring arrives, the community looks forward to other sports, and the Makaha Canoe Club (MCC) gets much of the attention. MCC President Ryannette (Marlene) Kahoonei shares that the founding families of the club included the Naone, Abad, Dutro, and Lum Ho `ohana. The club’s original purposes were, and still are, to perpetuate and promote Hawaiian culture and traditions through the ancient sport of canoe paddling, to provide a team sport for the Leeward Coast community, and to offer a community activity for the families along the Waianae Coast. MCC has nine members on its Board of Directors: President Ryannette Kahoonei, Vice President (currently vacant), Secretary Leinani Keao, Treasurer Hensley Lopez, Head Coach Fran Tuinei-Keliikoa, and board members Arlene Guererro, Ralph Kahoonei, Steven Kalili, and Maddy Lopez. There are also two honorary lifetime members from our Makaha community – Uncle Phillip Naone and Uncle Buffalo Keaulana. While MCC has seen many ups and downs since it began in 1971, it is now on the upswing with new changes in place. In the summer of 2013 the club regained its active member status in the Oahu Hawaiian Canoe Racing Association (OHCRA) and currently sponsors Kamaile Academy Public Charter School’s Na `Alaka`i Hoe Paddling Team during the Na `Opio winter season. Paddlers as young as nine years old and as old as 65 are currently active members of the club. Paddling is a healthy, fun sport that can keep the keiki and adults active during the summer. The summer season has already begun , and MCC is again reaching out to the Leeward Coast community to come out and paddle. They are currently seeking new members – boys and girls who are 11 years and older, as well as adults who are new or seasoned paddlers. This year’s fees are $45 for youths, 11-17 years old, and $75 for adults. These fees will be used to pay for bus travel, club waivers, team jerseys, regatta lanes, club insurance, and more. In order to join, a copy of a birth certificate or legal identification, such as a medical card or driver’s license, is needed with the registration form. Paddling practices are held on Mondays, Tuesdays, Thursdays, and Fridays starting at 4:00 P.M. in front of the first lifeguard station at Makaha Beach where you can see MCC’s signature purple canoes, the Makaha and the Makana. Racing season runs from June 1 to August 2, 2014, and are held at various beaches around O`ahu’s coastline. For more information, contact Ryannette at 808 216-2225, email: makahacc2012@gmail.com, or P.O. Box 1338, Waianae, HI 96792 – or simply come to practice. MCC would love to have you!